I consider grocery shopping to be one of least interesting things that I do by bicycle. Compared to figuring out a way to carry two kids simultaneously up and down steep hills, it’s not particularly challenging. I am always surprised to find out that the question of how I carry groceries is interesting to people. Even weirder to me, people who don’t ride bikes regularly typically assume that we must use car share to shop, because no way could we carry groceries on a bike. And I am thinking: dude, we did our shopping by bike even when we owned a car (as a California resident, I am legally required to use the word “dude” at least five times a day). We live in San Francisco, which is not packed with the kind of giant supermarkets featured in suburban locales. 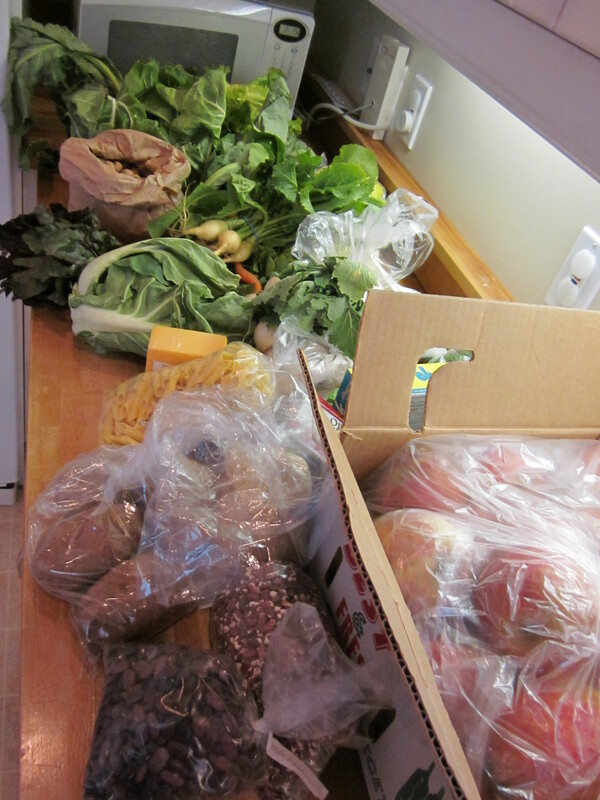 Thus we are not once-a-week shoppers, because we pick up groceries here and there en route to other destinations. Last week, just as an exercise, we shopped entirely without the Bullitt, which can carry anything, figuring that most people do not have a cargo bike. General groceries: There is a Trader Joe’s a block from my office. There is no point in driving to this location, which is the busiest in the entire United States, and where the line to park stretches dozens of cars back at all hours. I usually walk to the Trader Joe’s once a week during my lunch break and pick up things like milk, yogurt, cheese, and pasta. The Trader Joe’s near my office does such a land-office business that its produce is actually okay, so I will also pick up organic fruit on sale. 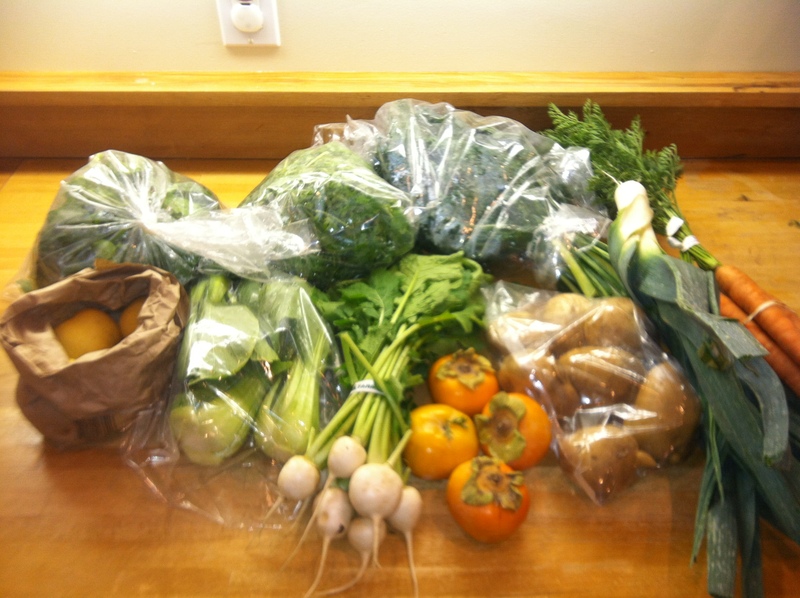 Farm share: Matt takes a martial arts class in our neighborhood on Thursday evenings. On the way home he detours a few blocks to pick up our farm share produce. He transfers the contents into a pannier for the ride home. Farmers market: Our farm share doesn’t provide much fruit, but our kids eat a lot of it, so on Sunday mornings I go to the neighborhood farmers market. My son’s birthday party was this weekend so I bought a full flat of strawberries for the party instead of our usual half-flat. I also picked up four bags of kettle corn at a local grocery store because the boys watched a movie during the party and requested it. 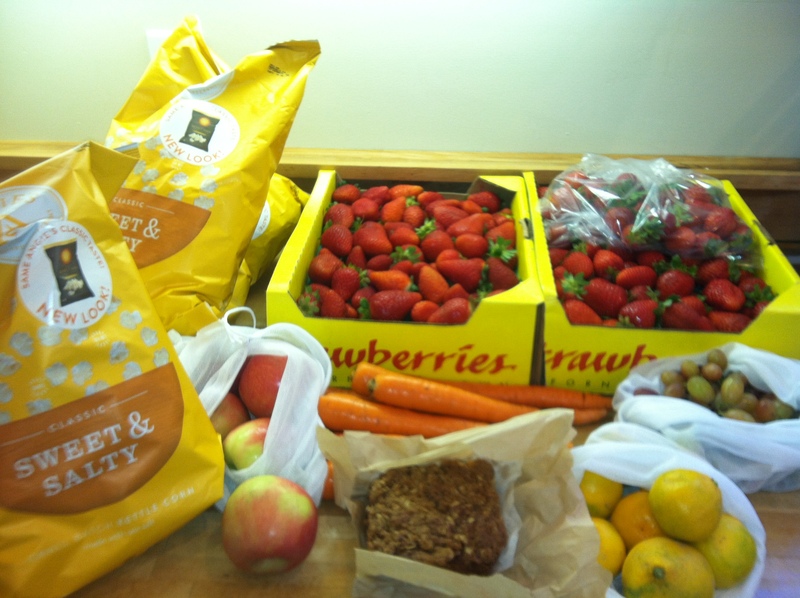 A farm share + Rainbow trip by Kona MinUte: produce and bulk shopping in the panniers plus a 25 lb. box of apples strapped to the deck, no problem! Odds and ends: We are vegetarians so we don’t buy meat. We also don’t usually buy things like cereal and bread because we make them. However that means that every few months we need to make a trip to Rainbow Grocery for staples like flour, along with occasional bulk purchases of olive oil, salt, grains and beans. We also stop by Costco (which is across the street from Rainbow) on roughly the same schedule for things like compost bags, toilet paper, and the tissues that we donate to our son’s school. Historically these stock-up trips have been by car share if we’re with both kids (or if Matt passes by the neighborhood while in a business-related car rental), or by bike if one of us was going solo. Matt’s Kona MinUte can carry anything we’ve ever bought at Rainbow and then some, and it’s not even a full-sized cargo bike. Lots of people shop at Costco with ordinary bikes. Five pizzas for a kid’s birthday party in the Bullitt is also no problem. Our future bulk shopping trips will almost certainly be by Bullitt, because it’s more fun and has zero marginal cost. We haven’t used car share since this bike rode into our lives in the middle of last month. 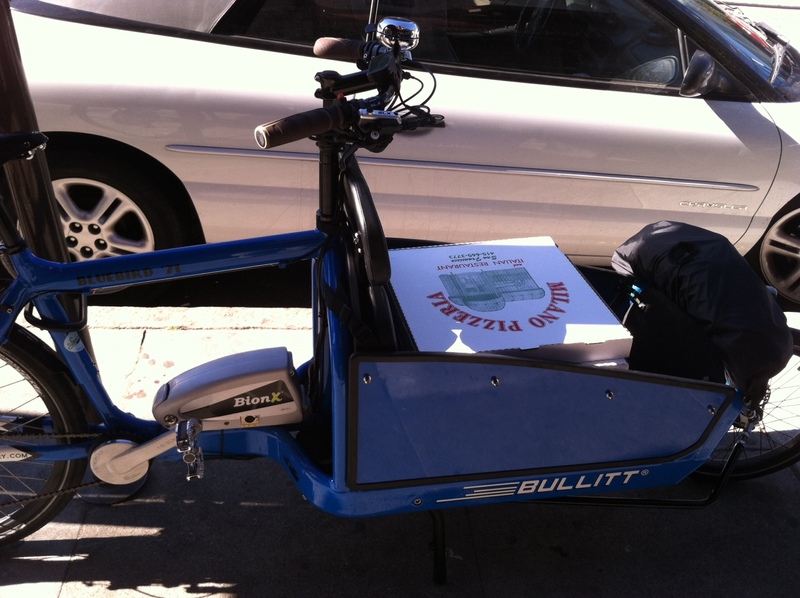 For our son’s birthday party on Sunday, Matt took the Bullitt to pick up five pizzas. A load like that isn’t even a challenge for a bike like this. If you get a real cargo bike your ambitions scale up accordingly. But even with just a midtail and our limited ambitions, we have carried a Christmas tree, two kids and their gear, each other, and the Brompton. A week or even a month’s worth of groceries barely ranks on this scale. Ride on, shoppers. This is timely! Since getting the Boda Boda a few weeks ago I’ve amazed myself by doing the very thing I bought it for: transporting myself and my child to preschool then work, with my laptop bag and his backpack in panniers. 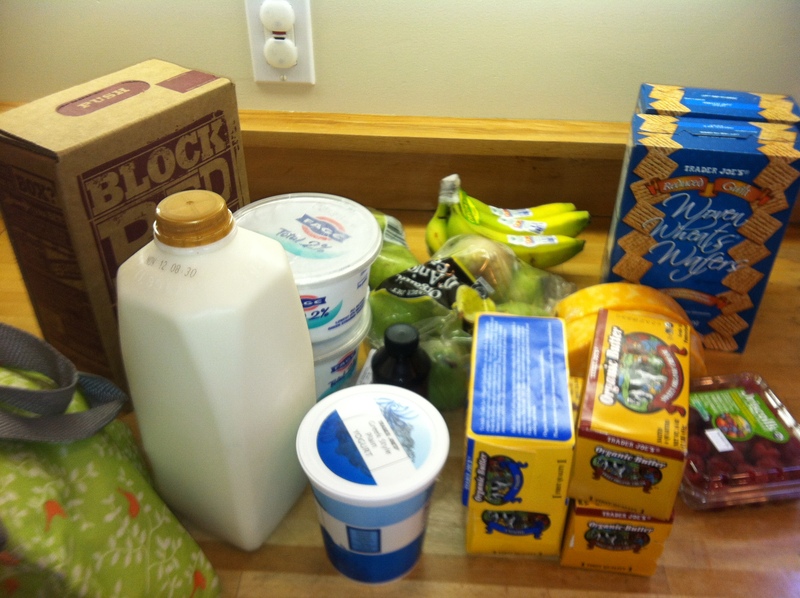 But this past Sunday, when it was time to do our weekly grocery shopping, I hesitated. Where would two cartons of eggs and a gallon of milk go? What about five 28-ounce cans of tomatoes and two loaves of bread? How about those ripe avocados and bananas? I thought about bungeeing a crate to the side-loaders, but alas, I don’t even OWN a crate! And my load seemed too large in general even if I had a crate. So I took the car. Sigh. I’ve been kicking myself and my lack of ingenuity ever since. But I do have an order in for the Yuba Bread Basket and a Baguette Bag, so when those come in, I should be in better shape, I think. Interesting! I think everything on your list would fit on in a Baguette bag. Maybe it’s the fact that it’s an irregular trip that makes it seem intimidating? I do like having a front basket for the more delicate items though. Well, I don’t have the Baguette Bag or the Bread Basket yet, so I think that those will make a real difference when I finally get them! I had many more things on my list; I listed the tomatoes, the bread, etc. because those were the things that made me hesitate to do the trip by bike. The combination of heavy stuff (cans) plus delicate stuff (eggs, bread, bananas) made me nervous. In the end I had three large canvas bags full of groceries plus a gallon of milk and two cartons of eggs. For those used to “car shopping”: the hurdle for me was understanding that I should go to the grocery store more often (on the way to/from work or during lunch, like HotC writes above). I don’t think it takes more time than it would via car since bike parking is easy (and it’s more or less on the way). Strapping megaloads to my bike can take a bit of time and it’s slower traveling– the smaller grocery runs are definitely more packing efficient and speedy. For the non-cargo cyclers– I recommend a basket and the Rivendell Sackville Saddlesack (medium or large, if it can fit your bike– rivbike.com– BTWno affiliation with Riv). It makes for quick and easy grocery stops of one or two (maybe three) paper-grocery-bag-sized loads, since you can just plop ’em in. Also great for party beverages. You know, we haven’t done big once-a-week shops since we moved into San Francisco, so I never thought about it, but I’m sure it helps to make smaller trips on our regular commute routes. It would seem really annoying now to go to a big store on a weekend and fight the crowds to do our shopping. The Saddlesack is gorgeous, but I also see a lot of people strap a wire basket to their racks here, and I used to just wrap the grocery bag in a bungee net and clip it to my rack. Ugly, but effective.